Sally A. Nuamah conducts research on issues of race, gender, education policy and political behavior. She completed her Ph.D. in political science at Northwestern University in June 2016. She was named a post-doctoral fellow at Princeton University and a Women and Public Policy fellow at the Harvard Kennedy School. During her time at Princeton and Harvard, Sally developed two book projects, one on the political effects of public school closure (When Schools Close, TBD) and the other on gender education policy in U.S. and Africa (How Girls Achieve, 2019). In 2011, Sally Nuamah graduated from GWU a recipient of the prestigious Gates Millennium Scholarship, Coca-Cola Scholarship and Princeton University Prize award. Most notably, she was awarded the GW Manatt-Trachtenberg Award, presented to a student who has significantly challenged the social and intellectual conscience of the university, inducted into the Phi Beta Kappa fraternity, awarded the Political Science prize, and named one of two Distinguished Scholars; the highest mark of distinction at the George Washington University. 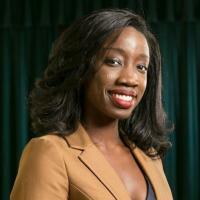 Sally Nuamah is now a Trustee on the George Washington University Board of Trustees. In addition to her work as an academic, Sally has experience working across Ghana and South Africa for a number of groups including the United States Agency for International Development and the United Nations Foundation. Her work primarily focuses on how policies influence disadvantaged groups and the ways in which groups can work together to resolve important policy issues through education. For her broader work, Sally has received numerous awards. Recently, she was named "Chicago's 35 under 35 leaders making an impact" by Chicago Scholars; received an "Under 40 award in Education" from Black Women Organized for Political Action, awarded a 2018 Global Emerging Leading Award by the Global Strategists Association and a 2018 Advocate Award by the Africa International House. In addition, Sally has an award winning documentary on girls and education titled, HerStory, that is currently distributed by Discovery Channel Education. To learn more about her film and global work, visit www.herstorythefilm.com.